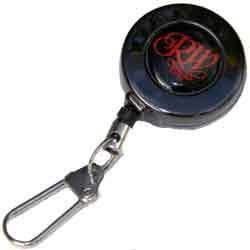 Richard Wheatley pin on retractor, a fabulous quality 'zinger' that has a smooth and powerful retraction system. 3 cm diameter. Durable zinc alloy, fitted with a nylon coated wire line and snap that is long enough to ensure grabbing the right tool isn't a trial. The pin on retractor is finished in an attractive 'gun smoke' colour.